Create a beautiful tuffet using a foundation-pieced panel. Make it whimsical or formal - your choice! New 2 1/2 strip packs are available to make it easy! 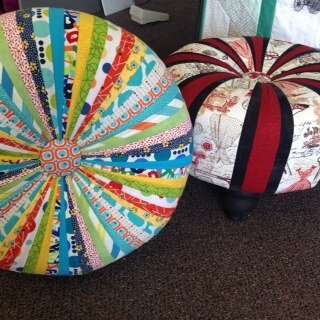 Requirements: Tuffet Foundation Pattern for $28.00. Tuffet Finishing Kit for $70.00. The Tuffet kit will include pre-drilled furniture quality wood base with T-nut pre-installed. Upholstery foam, upholstery batting, cording, 2 1/2 button, felt to cover the bottom of tuffet and upholstery tacks.